Grain shape is an important trait that determines appearance quality in rice. In order to dissect the genetic basis of this complex trait, we constructed an F2 and derived F2:3 lines from a cross between a long-grain variety and one with an intermediate grain length. The F2 population was genotyped by the RICE6K array to construct a high-density linkage map. A total of 30 quantitative trait loci (QTL) for grain shape were detected over 2 years. A major QTL cluster on chromosome 7 had a strong effect on grain length and width, consistent with the effect of GL7/GW7. The other QTLs, qGL2, qGW2, and qGL12, had large effects on grain shape and were detected in both years. The effects of four QTL on seed size as well as grain yield were then validated by using BC1F6 populations derived from selected F3 plants with residual heterozygous genotypes on each QTL region. 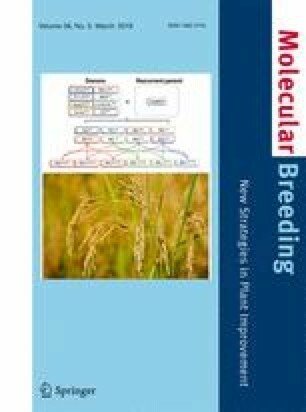 Our study indicated that the SNP array was an efficient genotyping method for QTL mapping, and the novel QTL, qGW2 and qGL12, provided insight into the genetic basis of grain shape as well as additional genetic resources for developing elite rice varieties. The online version of this article ( https://doi.org/10.1007/s11032-019-0955-x) contains supplementary material, which is available to authorized users. J.C. analyzed the data and wrote the paper. H.Z. and D.X. analyzed the data. Y.G., B.W., G.G. and Q.Z. participated in the field management and logistic work. Y.H. designed and supervised the study. This work was supported by grants from the National Program on R&D of Transgenic Plants (2016ZX08009003-004) and the National Natural Science Foundation (91635302), and earmarked fund for Agriculture Research System (CARS-01-03) in China.